On Saturdays and Sundays, visit Five Points for their outstanding brunch. A basket of warm, sugary Beignets is presented with Berry Butter. I wanted to eat as many as I could fit in my mouth. Beignets are like donut holes, but less cakey. They are insanely tasty. 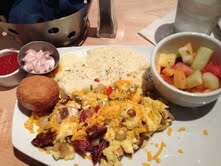 The Five Point Scramble is a steal for the amount of food you get: A hash of Scrambled Eggs, Duck Fat Potatoes, Bacon, Oyster and Shiitake Mushrooms, Green Onions and Shredded Cheese, alongside Three-Cheese Grits and Fresh Fruit. The Duck Fat Potatoes left me a bit underwhelmed, as I was looking for a richer flavor, but overall the dish is extremely satisfying. Being a cheese grits fan, I enjoyed this preparation, and would surmise the three varieties to be goat, white cheddar and parmesan. The fruit was tossed with a lovely, light mint dressing to cleanse the palate. The server asked for egg preparation preference for the Eggs Benedict, which is rare. Soft Poached Eggs were chosen, versus Hard Poached. The English Muffin was nicely toasted, not charred, with Canadian Bacon and Hollandaise. Prime Rib and Eggs reminds me of my Spring Break in Vegas – one of the few things I remember from Vegas - I believe the special was $4.99 for steak, eggs, toast and hash browns, and it was actually delicious. Five Point’s variation is a bit more expensive, and includes an 8-ounce Slow Roasted Prime Rib, with Eggs any style and Grits. Hearty. For lunch, the Grilled Chicken Salad is simple, but as good as they get. It’s a classic “lady” salad: Craisins, Goat Cheese, Dates and Tomatoes are spritzed with a Tangy Champagne Vinaigrette. Delightful. I will be back to try the Carolina Hash and the White Chocolate Bread Pudding. I’m rooting for this place, as I think many are. Want to get my latest reviews via email? Movies and food are two of my biggest passions. For my New Year’s resolution in 2012, I decided to start this blog, reviewing “Cuisine and Screen.” I love an artsy independent film as much as a summer blockbuster, and “Award Show Season” is my favorite time of year (don’t try calling me the night of the Golden Globes, SAGs or the Oscars.) I miss strolling the aisles of video stores (RIP) and finding gems I missed at the theatres, hidden among thousands of DVDs. I'm excited to write about new movies as well as ones I’ve just seen for the first time. My Food Network addiction has led to many triumphs (and disasters) in the kitchen. So instead of a recipe blog, I decided to chronicle as many restaurant experiences as my wallet permits. I hope you find this blog entertaining and informative, and that it gives you some suggestions for your next movie night or special dinner out!